Seychelles’ business community calls for joint venture with government. The Seychelles’ business community is calling on the government to facilitate their task in achieving one of the Tunis goals: to look at ways of using information and communication technologies to improve living standards in the community. “By investing together in the information society we’ll share its ownership and develop it together for the benefits of the Seychellois community,” says the Seychelles Chamber of Commerce and Industry(SCCI) ’s Secretary General Nicole Tirant-Gherardi. SCCI is a member of the International Chamber of Commerce (ICC) and was represented at WSIS in Tunis by CCBI – the Coordinating Committee of Business Interlocutors chaired by ICC. The need to develop a public-private partnership in the information society is because each side compliments the other. The government in Seychelles is responsible for providing: education and training, the rule of law, a neutral competitive marketplace and the protection of intellectual property. On its part the business community brings with it invaluable market experience and the ability to put that knowledge into practice. “There’s a need for a more interactive involvement by the government in the local ICT industry. Setting regulations that simply get accepted doesn’t go far enough. Both sides should sit down and exchange views on ways of improving the lives of every person on these islands,” says Galen Bresson of The Home Electronic Shop. The business community is urging the government to open up dialogue on how they can share the financing cost of joining the SAFE (South Africa-Far East) fibre-optic network. SAFE is a connection of over 13,800 km from Cape Town in South Africa to Malaysia, linking Seychelles’ neighbours Mauritius, Reunion and India on the way. “This connection will make trade and communication easier between the international markets and Seychelles with added high capacity, speed and reliability and costumers will observe a great drop in Internet charges,” says ATLAS’ Executive Chairman, Mark Hoareau. The private sector also believes the government should seriously consider plans of selling Seychelles as an ideal destination for the setting up of a “Silicon Valley,” as an additional export service to boost the country’s decelerating economy. “Seychelles is well placed to be competitive in this sector. We are perfectly situated between the European and Asian time zones, have an educated bi-lingual population, a health hazards free and politically stable country. If those won’t sell we still have the sun, sea and sand,” concludes SBC News journalist Lindy Vital. In any community ICTs will flourish only if business investment and national governments work in close consultation with civil society, interest groups and the scientific and technical communities. By coming together they’ll be capable of creating an environment in which there’ll be an improvement in the standard of living. Airtel launches Seychelles’ first SMS promotional service. It came unannounced and unexpectedly: an SMS from local singer, Sheila informing Airtel clients that her second solo album Mon Enfant II, is now available on the market. Reminiscent of the Minority Report saga in the US, whereby complaints were registered about promos sent to mobile phones to promote the 2003 Tom Cruise’s movie, not every Airtel consumers were happy. “The service provider should have sought their clients' consent first. Now they’re proposing that consumers should inform them if they do not want such promotional service. Yet we know even if we response by a phone call or a SMS we still have to pay,” says the National Consumers’ Forum (NATCOF)'s Director Rachel Marie. Airtel says the decision to launch this service came after being approached by many companies and individuals who realised the potential of advertising on SMS. “Being a young innovative company, Airtel is always striving to introduce news services where technology allows,” says Retha D’offay, a marketing officer of Airtel. “NATCOF welcomes such an initiative as consumers are given the opportunity to have information at their finger tips, but at the same time consumers must be in a position to make the right choice and not have the service provider thinking for them,” according to Ms Marie. SMS has proven to be an extremely effective advertising media. Through Airtel alone 24,000 customers (both postpaid and pre-paid) can be reached instantaneously. “Due to mobile phones being part of almost everyone’s daily lifestyle, it seldom leaves its owner’s side. Unlike a phone call, sms can be read at the owner’s convenience, reducing inconvenience during advertising,” remarks Ms D’Offay. To send a promotional SMS to the whole subscribers’ based; it costs Rs2, 000 per message or Rs5, 000 for four messages. “Such scheme should heighten local artisans’ creativity, as they now have another opportunity to share information with the general public on SMS,” says the Small Enterprise Promotion Agency (SEnPA)’s Public Relation Officer Mastura Shah-Clarisse. Since the launch of its new advertising media, Airtel says it has received many inquiries. The most important potential of SMS would be seen in the case of an emergency. SMS can be used to warn people of the oncoming natural disaster, like tsunamis, or social messaging for example HIV/AIDS awareness, etc…. One year of cable television: How well are we flaring? The cable television company, Intelvision marked its first anniversary this week, with most Seychellois being left aside in the celebration. The persistent criticism against Intelvision is the rather out of reach charges for most average wage earners. Although the company recently stated “the service is continuously proving its popularity by the constant growth in the number of new subscribers” and that “the figures are well above their projected targets,” critics chose to take this with a pinch of salt. A sign of hard time for the company is that it has been forced to offer easy-payment terms to its customers giving them greater financial flexibility and encouraging more households in Seychelles to subscribe. Basic, 7 channels for Rs75/month. Executive, 15 channels for Rs250/month. Indian, 5 channels for Rs250/month. Prestige, 28 channels for Rs400/month. Extravagance, 41 channels for Rs600/month. Following several complaints, the company is now allowing customers to pay the installation charges over a period of five months, plus you get the Executive package free for a month or you only have to pay the difference for any other packages you wish to subscribe to. Customers are now also allowed to upgrade or downgrade their packages at the end of the subscription period. Intelvision has also been criticised for forcing customers to buy one decoder per TV set, although technologies that allow households to watch more than one channel simultaneously do exist. In an effort to increase its customer base there have been press report recently that the company is offering employees from large organisations discount packages. The company receives TV signals via satellite from the South African company, Multi-Choice. Therefore, all programmes are two hours ahead of scheduled times. On the occasion of its first anniversary Intelvision has announced plans to widen the range of channels for its viewers and expand its services with the launch of Voice over Internet Protocol (VoIP) and Internet services by early next year. Creole needs to be developed further towards the Internet. The 20th edition of Festival Kreol ended last week in Seychelles. In conclusion, linguists offered a strong warning that if the Creole language is to survive, then its rightful place in cyberspace has to be ensured. At present, it’s evident that Creole is used minimally on the web. “To ensure its propagation, a Cyber community for it will have to emerge gradually, whereby a group of people communicate in Creole using communication and information technologies, ” said the Chief Technology Officer from Reliant Unified Solution, Ronny Adonis. Creole has already got a standardized spelling system. Now what’s needed is to develop it further towards the Internet. "One way around this is to encourage a web culture amongst local businesses, whereby locally built web sites use Creole as a working language alongside French and English,” remarked Jaya Nair from Space '95. One of the key arguments hindering the spread of Creole in the Information Society is the adoption of words for technology that have not been developed in Seychelles. “We should support actions aimed at teaching Creole, in order to consolidate, or even to increase, the number of the people able to use it to communicate through ICTs,” suggested George Thande from the local daily newspaper, The Seychelles Nation. The director of the Creole Institute, Penda Choppy, said we needed assistance at international level. This would help to solve many technical problems, such as the creation of software that would allow the browser to translate and read the content of any pages written in most underprivileged languages, for example Creole. The institute has indicated that it has plans to create language courses in Creole. This will be done by applying modern technologies such as multimedia support, CD-ROMs, books, the Web, etc. in support of systematic targeted instruction in the language and its spelling. “Once it has been educated, this community of Creole speakers will easily be able to use Creole to communicate on Internet, and it will be gradually transformed into a cyber community,” suggests Mrs Choppy. “The aim must be to make any language a working language for it to stay alive,” she added. Seychelles Digital: Simplifying the bigger picture. Whilst hosting the Seychelles Broadcasting Corporation (SBC)’ s AM Service weekly midday show – Kot Lakour – in 2003, a bright idea suddenly dawned on me. ·How do you choose electronic devices? ·Can you trust anybody to fix your electronic devices? These simple questions, I had hoped, would help provide answers. The point is that users should not struggle to use new technologies. If anything, they should enjoy the benefits that home electronics have to offer. However, the idea soon developed into a 30-minute fortnightly magazine show. The show debates issues such as, how and under what conditions Information and Communication Technologies (ICTs) can best be used in the development process of Seychelles in general. The programme is the only one of its kind and it promotes information society issues locally. It also aims at opening up communication channels, which reach out to all Seychellois. Listen to Seychelles Digital every two Wednesdays @ 7.30pm. The repeat is on the following Sunday @ 10.30am (AM: 219m 1368 kHz. Online: SBC Radio). Welcome to my Seychelles Digital blog. This page is a work in progress dating back to September 2005 cataloging news of Seychelles ICT sector. To date my effort has won two international awards: Best Radio Talk show at the 2nd Gender & Media Award in South Africa in September 2006 and Excellence in ICT Journalism in Africa at the 9th African ICT achievers awards in Johannesburg in November 2007. 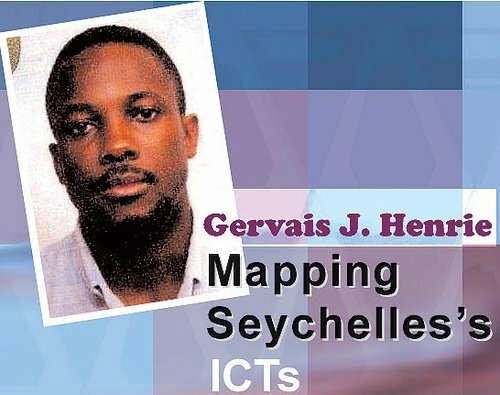 I hope my work help further your interest in the Seychelles ICT sector. Happy browsing. A team from the US Department of State is in Seychelles to help plan how to use its expected oil and gas revenues wisely,. The team is from the Energy Governance and Capacity Initiative (EGCI) and its leadar is leader Paul Hueper. He says the EGCI helps the world’s next producers on how to use the revenue when they discover the oil. ATLAS Internet services provider, providing access and hosting services, with a directory of the business Web pages it hosts. KOKONET offers a Virtual Domain Service for those who wish to receive mail and make their web pages and ftp files visible under their own domain. INTELVISION is an innovative cable operator that started operations in October 9th 2004, and provides a diverse range of telecommunication services in the Seychelles. AIRTEL TELECOM - SEYCHELLES, is committed to bring Seychelles the best in telecommunications. The strength behind Airtel is the Bharti Group, a telecom giant - the biggest private integrated telecom conglomerate based in India. CABLE & WIRELESS SEYCHELLES LTD forms an integral part of the Cable & Wireless world wide group of businesses. Today, Cable & Wireless Seychelles Ltd provides over 20,000 telephone lines and about the same number of mobile phones in Seychelles. SPACE95 is the leading Information Technology Services Company in the Seychelles. The SEYCHELLES BROADCASTING CORPORATION (SBC) is the national public broadcaster of the Seychelles. The corporation was formed on May 1 1992. SEYCHELLES NATION the local daily newspaper which provides news stories, searchable archives and weather forecast. Le NOUVEAU SEYCHELLES WEEKLY is one of the 7300 newspapers listed in the 4imn.com media directory. The paper under the editorship of Ralph Volvere is affiliated with the Seychelles Democratic Party. YellowPages.sc provides comprehensive information on all existing and newly-created businesses in Seychelles, the Seychelles Government plus other useful information such as the international brands available in Seychelles, foreign exchange rates, international direct dialing (IDD) codes, links to useful websites in Seychelles and online banner adverts. ICT (information and communications technology - or technologies) is an umbrella term that includes any communication device or application, encompassing: radio, television, cellular phones, computer and network hardware and software, satellite systems and so on, as well as the various services and applications associated with them, such as videoconferencing and distance learning. ICTs are often spoken of in a particular context, such as ICTs in education, health care, or libraries. The term is somewhat more common outside of the United States. According to the European Commission, the importance of ICTs lies less in the technology itself than in its ability to create greater access to information and communication in underserved populations. Many countries around the world have established organizations for the promotion of ICTs, because it is feared that unless less technologically advanced areas have a chance to catch up, the increasing technological advances in developed nations will only serve to exacerbate the already-existing economic gap between technological "have" and "have not" areas. Internationally, the United Nations actively promotes ICTs for Development (ICT4D) as a means of bridging the digital divide.